Samsung goes on to expand it’s offerings in the HHP segment with new cameras ahead of CES starting on Monday in Las Vegas. Samsung has huge plans mostly in the consumer electronics category in the home. Cameras are just part of what will be showcased at CES come Monday. Well, slightly ahead of this date, Samsung wanted it known that there are two new point and shoot cameras, the Android powered Galaxy Camera 2 and the NX30, a mirror-less smart camera. Unlike the flagship camera announced last year the Galaxy NX, this one doesn’t run Android, it’s just smart with Samsung proprietary OS just like previous Samsung Smart Cameras. 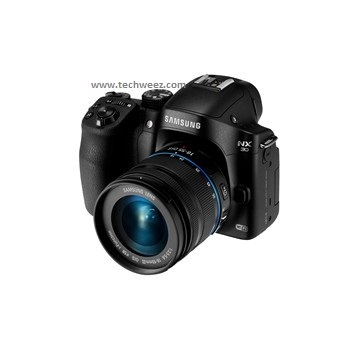 Samsung has a lot of emphasis on the smartness of the award winning series of NX cameras and their ease of use. “The NX30 allows photographers to shoot with confidence, providing a seamless ability to capture moments and share them immediately, delivering exceptionally beautiful photographs while creating an unmatched photo-sharing experience,” said Myoung Sup Han, Executive Vice President and Head of the Imaging Business Team at Samsung Electronics. With it’s 20.3MP APS-C CMOS Sensor and Samsung XN AF System II, it’s quite a capable camera for the professional with fast autofocusing at 1/8000 sec Shutter speed and 9fps Continuous Shooting Function. It also comes with an 80 degree tiltable electronic viewfinder for creative view angles and the 3 inch Super AMOLED Swivel Touch Display that also allows for selfies or even shots where your face cannot fit. It comes with smart features like Tag & Go where you can share images with other NFC enabled smartphones, did I mention that it’s NFC enabled? Other functions include Photo Beam that allows for no-configuration file sharing with other devices by touching them together. The other function is MobileLink that allows for sharing to upto four separate devices concurrently. Autoshare on the other hand automatically shares each photo you take to your other device like smartphone, come in handy if you want to instagram a high res photo. Remote Viewfinder Pro is another function that allows you to use a smartphone to control the camera remotely, functions like zoom and capture where you don’t have to use timer function to be in the frame. NX30 also comes with Dropbox and Flickr apps pre-loaded in some regions for direct-to-dropbox uploading. These two features are a first in point and shoot cameras not running Android. Samsung also launched two lenses in what’s now referred to as the Premiums S Series Lenses, the professional 16-50mm F2-2.8 S ED OIS Lens and the non-professional 16-50mm F3.5-5.6 Power Zoom ED OIS lens for your everyday use. All these devices will be demoed at the Samsung Booth at CES come Monday 7th in Las Vegas.